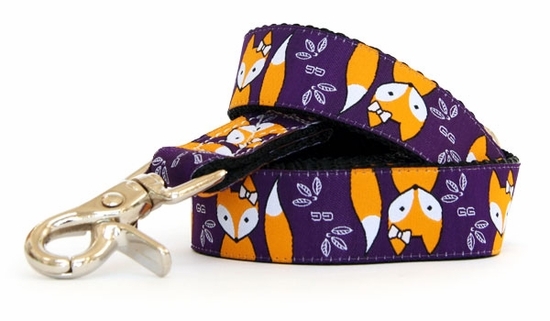 If you love Wes Anderson films and woodland creatures then Muir Woods Foxy Lady dog collar is for you. An adorable and whimsical fox with a sweet bow in her hair on a deep purple background. Made in USA from durable nylon webbing with high quality nickel plated hardware. Machine wash and line dry. Our 1" & 5/8"leashes Feature a handy "D" ring sewn into the handle, to hold a Poo Bag dispenser or your extra house key.